26 May 2017 - This year marks the 50th anniversary of the ASEAN carrying the theme of “Partnering for Change, Engaging the World.” Since its establishment, ASEAN has evolved into one of the world’s most dynamic regions with accelerated economic performance in recent years.To commemorate the golden celebration of ASEAN@50 this year, MITI as Malaysia’s national coordinator for the economic pillar, will also be organising various programmes and activities. Today’s seminar on ASEAN ECONOMIC COMMUNITY (AEC) among many, serves as another platform for MITI to showcase and provide a solid testimonial to Malaysians at large, the benefits as well as opportunities drawn from the ASEAN regional integration. Welcoming remarks was delivered by YB Dato’ Sri Mustapa Mohamed, Minister of International Trade and Industry. 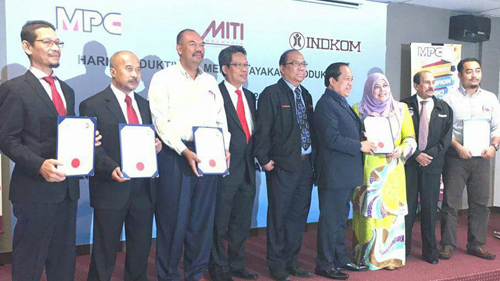 Also present at the seminar were YB Datuk Ahmad Maslan, Deputy Minister (Industry) MITI and representatives from MITI and agencies. YB Dato’ Sri Mustapa Mohamed, MITI Minister today chaired the first National eCommerce Council (NeCC) meeting this year. Since its establishment one year ago in 2016, the Council has worked hard towards enhancing the development and competitiveness of the eCommerce ecosystem. The Council discussed in detail the implementation of the National eCommerce Strategic Roadmap (NeSR) for 2017 and 2018 including the Key Performance Indicators for each of the six thrust areas under the Roadmap. YB Minister also attended a briefing by leading eCommerce players such as Pos Malaysia, Passion Tree Marketing, Printmax Labels, Printicious, Creativize and EDZ Boutique who shared their recent success stories both in Malaysia and globally. The Ministry of International Trade and Industry (MITI) held its 1st monthly assembly for the year 2017 today. At the assembly which was well attended by personnel from MITI as well as its agencies, Minister YB Dato' Sri Mustapa Mohamed urged his officers to continue working hard to contribute towards ensuring a stronger economic growth for Malaysia. This he observed, was even more critical now due to the uncertainties ahead in light of global challenges. He also urged MITI and all its agencies to work as a team to implement all planned programmes with dedication and integrity. The event continued with the presentation of prizes and certificates to the winners of ‘MITI Reward Programme’ and 'Business Excellence Framework Evaluators'. YB MITI Minister also launched the 'MITI Glossary' which is a useful tool accessible to the public, that explains and simplifies various business terms. 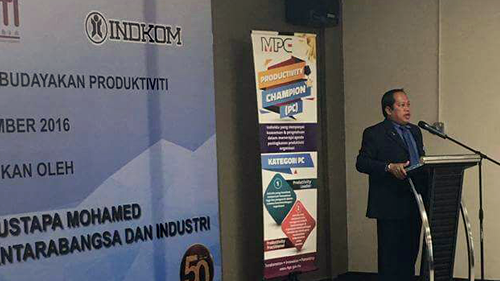 16 Disember 2016 - Perbadanan Produktiviti Malaysia (MPC) telah memberikan pengiktirafan Productivity Champion kepada 23 pakar dan institusi dan pengiktirafan Lean kepada 6 syarikat dari sektor perkilangan dan perkhidmatan. Majlis penyampaian sijil telah disempurnakan oleh Timbalan Menteri Perdagangan Antarabangsa dan Industri, YB Datuk Haji Ahmad Haji Maslan pada program Productivity Day di Indkom Engineering Sdn Bhd, di sini, hari ini. Di dalam majlis yang sama, Pertukaran MoU antara MPC dan Indkom telah diadakan bagi kerjasama pembangunan vendor Indkom. 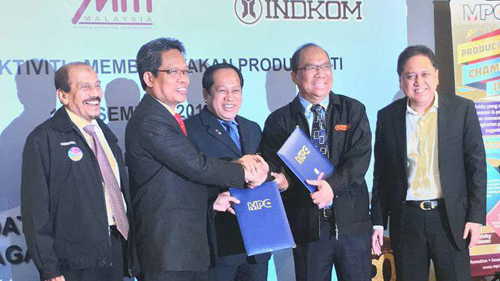 MPC akan membantu Indkom untuk meningkatkan produktiviti melalui pembangunan kapasiti dan sistem dalam bidang Persekitaran Berkualiti (QE/5S), Pengurusan Lean dan Kecemerlangan Perniagaan (Business Excellence). Turut hadir adalah beberapa rakan kerjasama strategik Indkom yang terdiri dari TNB, Universiti Sains Islam Malaysia (USIM) dan Universiti Teknikal Melaka (UTEM). Halal Industry Development Corporation (HDC) conducted a Halal Malaysia dialogue session with Johor state government and Halal industry players on 8th December 2016 at Permata Ballroom, The Puteri Pacific Hotel, Johor Bahru. The welcoming speech was delivered by YB Datuk Haji Ahmad Haji Maslan, MITI (Industry) Deputy Minister. The objectives of the dialogue session is to review recent developments and future plans of Halal industry and identify the challenges faced by local Halal industry particularly in Johor in order to enhance and accelerate the growth of Halal industry development. Halal Industry Development Corporation (HDC) mengadakan sesi dialog Halal Malaysia bersama Kerajaan Negeri Johor dan pengusaha-pengusaha industri pada 8hb Disember 2016 bertempat di Dewan Permata, Hotel Puteri Pacific, Johor Bahru.